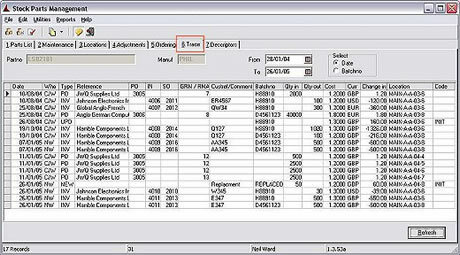 The STOCK module is used to record characteristics of individual stock items, view location and quantity information on specific parts, enable initial stock take-on and the transfer and adjustment of stock items. Stock allocation routines are called from all modules to ensure the most efficient use and rotation of stock. The warehouse can be designed and altered from within this module. KBS Windows uses a random binning system for stock. Each batch of stock is stored in a unique location. This reduces the amount of storage space required and helps to reduce handling errors when storing or picking. A perpetual inventory checking system is available. Stock valuations can be taken at any time. KBS comes as standard with a Main and a Quarantine warehouse. Additional warehouses may be purchased if required. The system also now has an optional upgrade to handle the processing of RoHS compliant stock. Save money through optimised use of warehouse space. Save time in stock taking through perpetual inventory. Monitor stock levels and age of stock. Better customer service through batch traceability. Save time and reduce errors when picking. Enhance accuracy and save time through Barcoding. Reduced levels of supervisor input in the warehouse. Improve productivity by monitoring adjustments. Minimise errors in stock handling. Optimised use of warehouse space. Easier for staff to store and pick. Weight parameters can be stored against each part.